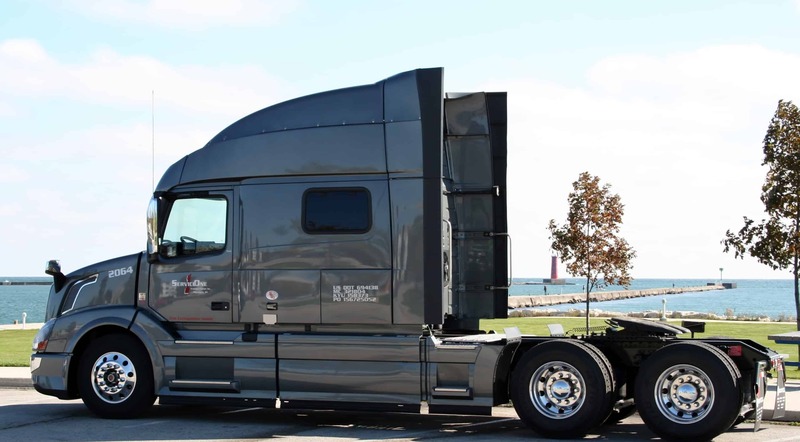 PLYMOUTH, Wis., July 16, 2018 /PRNewswire/ — The U.S. trucking industry was short 38,000 drivers in 2014; by 2024, analysts project that shortage could be as high as 174,500(1)—resulting in strong employment growth, rising pay and job security for qualified drivers. Service One Transportation, a leading Wisconsin trucking and logistics company, is currently hiring drivers with a Class A commercial driver’s license (CDL) and encourages job seekers to consider the advantages of a trucking career. Service One invites experienced and new drivers to apply for open positions. For career changers seeking a driving school in Wisconsin, Flagstad recommends the truck driving diploma program at Fox Valley Technical College, which is certified by the Professional Truck Drivers Institute (PTDI). Recent and soon-to-be graduates from accredited driving schools may qualify for tuition reimbursement from Service One. To learn more about Service One Transportation and its available trucking jobs in Wisconsin, visit https://www.serviceonetransportation.com. Service One currently has openings for both Class A CDL company drivers and owner-operators. The Wisconsin trucking company welcomes applicants from its home state and surrounding areas in Illinois, Indiana, Iowa, Michigan and Minnesota. Headquartered outside Plymouth, Wisconsin, Service One Transportation offers a full range of trucking and logistic services—including truckload, volume less than truckload (LTL) and expedited shipping—throughout the 48 contiguous United States and all Canadian provinces. Dan Flagstad, Sr. founded Service One in 1997 with a single truck; today, Dan Flagstad, Jr. oversees the family-owned and operated business, which now employs more than 50 drivers. The Wisconsin trucking company has earned multiple safety awards—including National Fleet Safety, Highway Safety and Workplace Safety—from the Great West Casualty Company. Service One has a longstanding reputation for unsurpassed customer service and is dedicated to “doing whatever it takes to get the job done right.” The company is also highly regarded among drivers, offering excellent pay, full benefits and a “family-first” culture that ensures a proper balance between work and family time. For more information on Service One Transportation and its trucking, warehousing, logistics and supply chain solutions, visit www.serviceonetransportation.com. Costello, Bob and Rod Suarez. Truck Driver Shortage Analysis 2015; report published by the American Trucking Associations; October 2015. State of Wisconsin Department of Workforce Development. “LT Projections 2014-2024” and “2017 Annual Wage or Salary” for Heavy and Tractor-Trailer Truck Drivers; Wisconsin Labor Market Information Data; accessed July 11, 2018.